Photo. 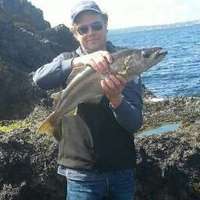 The local fisherman with the big caught in the Oslofjord at Gullholmen, Jeløya, Moss, Norway. It didn`t take long time before he could drag ashore a 3.8 kilo polock fish (sei, lyr). At Gullholmen there is a lighthouse called Gullholmen fyr. It was established in 1894, and replaced by a light in 1984. Here is a popular spot for fishing and partying. Other great places for fishing in the Oslo fjord around Jeløya are: Verlebukta, Reierbukta, Alby, Breidbukta and Kjellandsvikbukta. You find also good places along the coastline by Refsnes and Nes Camping. You can fish in almost untouched nature at the bay Reierbukta. It`s shallow far out in the water and fishermen need waders to reach out to the fish. Especially fishing trout is popular.